Mix chunks of room-temperature butter slowly into the dry mix, on a low speed. Add in peanut butter next, one spoonful at a time. Continue to mix until no large chunks of butter remain, and the mixture becomes crumbly. 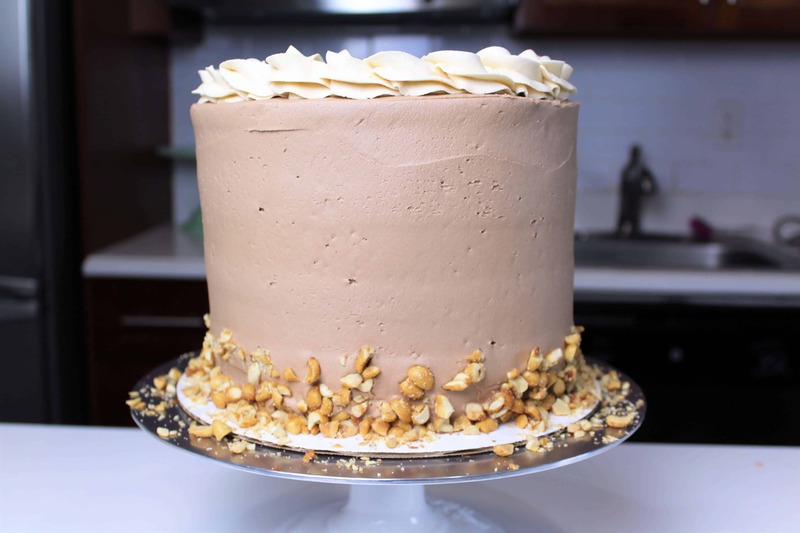 While the cake layers cool, prepare the peanut butter frosting. Cream together the butter and peanut butter on medium high for 30 seconds with a paddle attachment, until smooth. Slowly add in the powdered sugar, 1 cup at a time. Alternate with small splashes of cream. Once fully mixed, add in the cocoa, vanilla and salt, and beat on medium low until the ingredients are fully incorporated, and the desired consistency is reached. If the frosting is too thick, add in cream (1 teaspoon at a time). If the frosting is too thin, add in more powdered sugar (quarter of a cup at a time). Once the cake layers are fully cooled, assemble the cake. 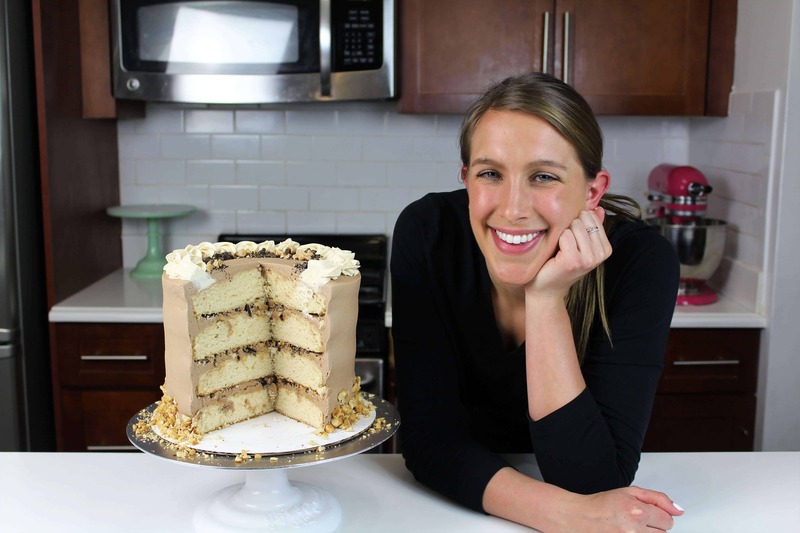 Stack and frost layers with buttercream, and sprinkle chopped peanuts, peanut butter chips, and chocolate chips on top. Repeat with remaining cake layers. Once fully stacked, apply a thin crumb coat, and chill the cake in freezer for 5 minutes. Once the crumb coat is firm to the touch, apply, a second, thicker coat of frosting. Smooth with a bench scrapper. If you want to see a full tutorial for how I get smooth sides on my cakes, you can click here. I also added a buttercream boarder to the top of the cake using a Wilton 1M tip, and added some honey roasted peanuts around the base of the cake, ad also around the interior of the frosting boarded. For the frosting is it 3 sticks (1 1/2 cups) or is it 4 sticks (2cups)? sorry about that! It’s 3 sticks (1 1/2 cups)! just updated the recipe! My dads birthday is coming up, and he loves Reese’s! 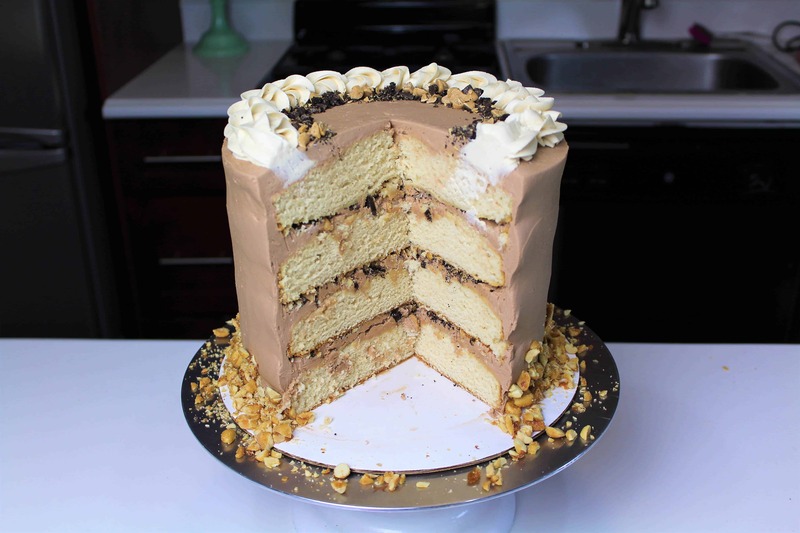 So I was thinking about making this cake, but is there anyway to alter the peanut butter cake to make it more chocolate like? Or anyway to incorporate chocolate? Thank you! yes! You can swap out some of the flour for baking cocoa 🙂 Or you can use some chocolate buttercream! !